A Pilgrim costume makes for a great costume for a Thanksgiving celebration, historical reenactment or class presentation. The Mayflower Pilgrims are iconic symbols of early colonial-era American history. One look at an image of pilgrim and you know exactly who they are. 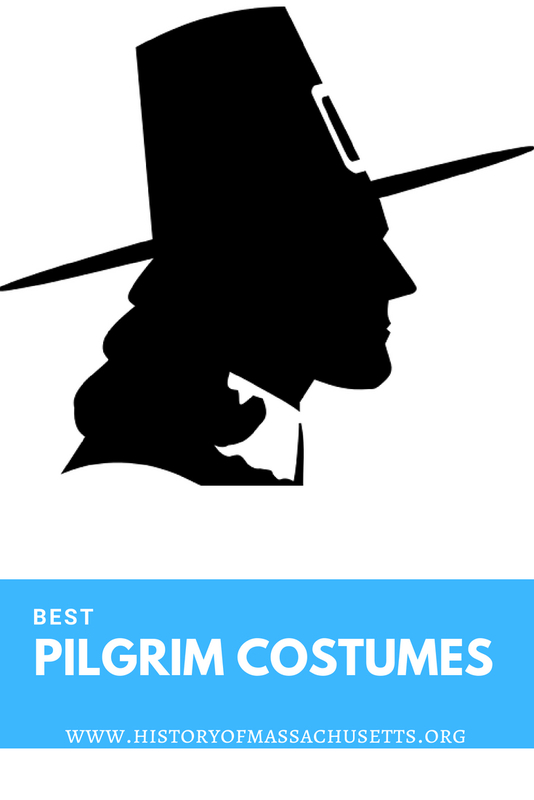 If you’re looking for an iconic pilgrim look, these costumes will do just fine. But, since these pilgrim costume don’t resemble what the pilgrims actually wore, they probably won’t fit your needs if you’re looking for a more authentic historical or late Jacobean-era costume. This Pilgrim Woman costume by California Costumes comes with a black dress with an attached white apron and collar. It also comes with a white bonnet with a ribbon tie that ties underneath the chin. The shoes are not included. The costume is made out of polyester and is available in sizes small, medium, large and x-large. The costume has great reviews on Amazon with many of the reviewers saying they used it for a variety of colonial-era costumes, such as a Thanksgiving costume, Salem Witch Trials costume and a Scarlet Letter costume. This Pilgrim Man costume by California Costumes comes with black breeches, a black shirt with a white collar and white cuffs, black belt and a black hat with a buckle. The stockings and shoe buckles are not included. The costume is made out of polyester and is available in size medium, large and x-large. The costume has great reviews on Amazon with some reviewers stating that it works great as a couple’s costume when paired with their partner’s Pilgrim Woman costume. This Pilgrim Girl costume by California Costumes comes with a black dress with an attached white apron and collar. It also comes with a white bonnet that ties underneath the chin. The shoes are not included. The costume is made out of polyester and is available in sizes small, medium and large. The costume has great reviews on Amazon with many of the reviewers saying it was great as a Thanksgiving costume or Halloween costume, but many reviewers also noted that it runs quite small, yet the dress is too long, so you should order up one size and hem it. This Child’s Pilgrim Costume Dress by Rubie’s comes with a grey dress with an attached white apron and collar. It also comes with a white bonnet that ties underneath the chin. The shoes are not included. The costume is polyester and is available in sizes small, medium and large. The costume has great reviews on Amazon with many of the reviewers saying they used it for a variety of historical costumes, such as a Thanksgiving costume, a Florence Nightingale costume and a Pioneer costume. This Pilgrim Boy Costume by Forum Novelties comes with black breeches, a black shirt with a white collar and cuffs, a black belt and a black hat with a buckle. The shoes and stockings are not included. The costume has great reviews on Amazon although some reviewers complained that the hat looks like a witch hat. One reviewer fixed this problem by pushing the top of the hat down so it had a flat top instead. This Pilgrim Boy costume by California Costumes comes with black breeches with an elastic waist, a black shirt with a white collar and cuffs, a black belt and a black hat with a buckle. The shoes and stockings are not included. The costume has great reviews on Amazon with many reviewers saying that it worked great as both a Thanksgiving costume and a Halloween costume. Some reviewers complained though that the hat is a bit floppy and doesn’t stand up well on its own but you could remedy this problem by stuffing it with newspaper or some kind of lightweight material. This Pilgrim Thanksgiving Hat by Forum Novelties is made to look like a Capotain, which was a tall, crowned, narrow-brimmed hat that the pilgrims and other Jacobean-era people wore. This black narrow-brimmed hat is trimmed with a black ribbon and a gold-colored buckle. The hat is made out of polyester with a suede-like finish and is available in one-size-fits-all. The hat has great reviews on Amazon with many reviewers saying it is a great costume hat to wear during Thanksgiving, although some reviewers did mention that they expected better workmanship for the price because the ribbon is sometimes glued unevenly. These colonial shoe buckles by Rubie’s Costume Co are attachable black and gold-colored shoe buckles that transform any black shoe into a pilgrim shoe. The shoe buckles are made out of vinyl and are available in one-size-fits-all. The shoe buckles have great reviews on Amazon with many reviewers saying they worked great for a variety of colonial costumes. This Adult Lady Pilgrim Costume set by Forum Novelties is perfect if you already have a dress and just need accessories to complete your costume. This set comes with a white apron, white sleeve cuffs, a white collar and a white bonnet. The black dress is not included. The set has great reviews on Amazon with many reviewers saying it made for a great pilgrim costume when paired with a black blouse and black skirt. Since many of the pilgrim men and boys costumes don’t include stockings, these Colonial Men’s Socks by Rubie’s Costume Co are a perfect addition to any colonial costume. These stocking are made out of polyester and are available in one-size-fits-all. The stockings have great reviews on Amazon with many reviewers saying they were very comfortable and fit well even if you are tall or have large calves.